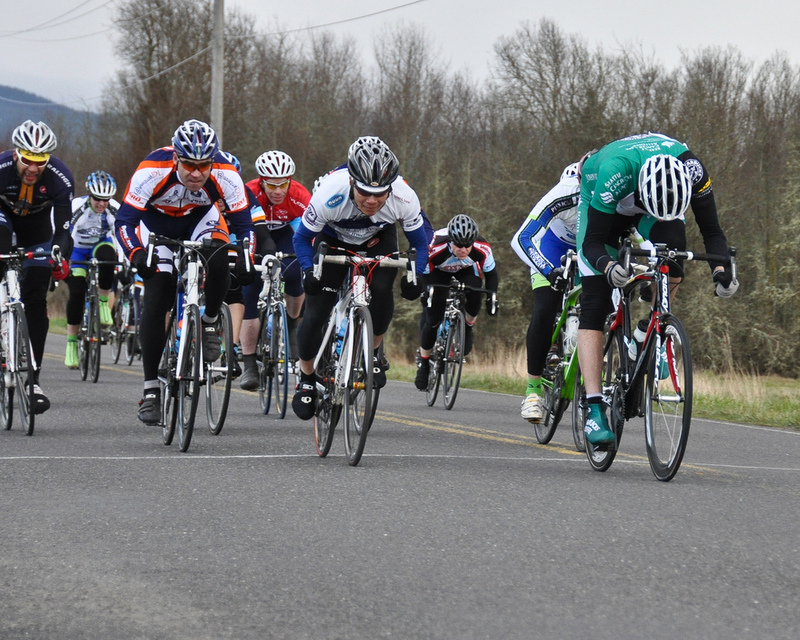 This weekend was my first bicycle race of the 2011 season. 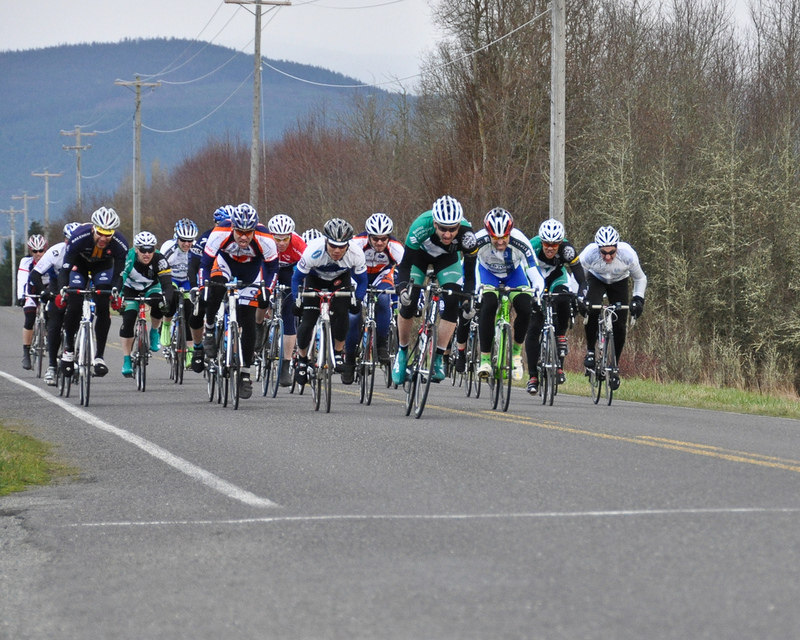 As opposed to previous years, this time I’m skipping most of the earlier WSBA races – I’m planning to be on form later in the year, so I can fully enjoy racing in sunny conditions vs. the rainy, crappy slop that typically comprises a Pacific Northwest spring. Last year, I intentionally focused on being in top shape early in the year because I was anticipating the birth of my daughter in April. I figured my whole season might have been over after April with a new baby and all, so I needed to make the most of the early season! This year, I’m not so worried about schedule – I’d rather race in the sun, though! 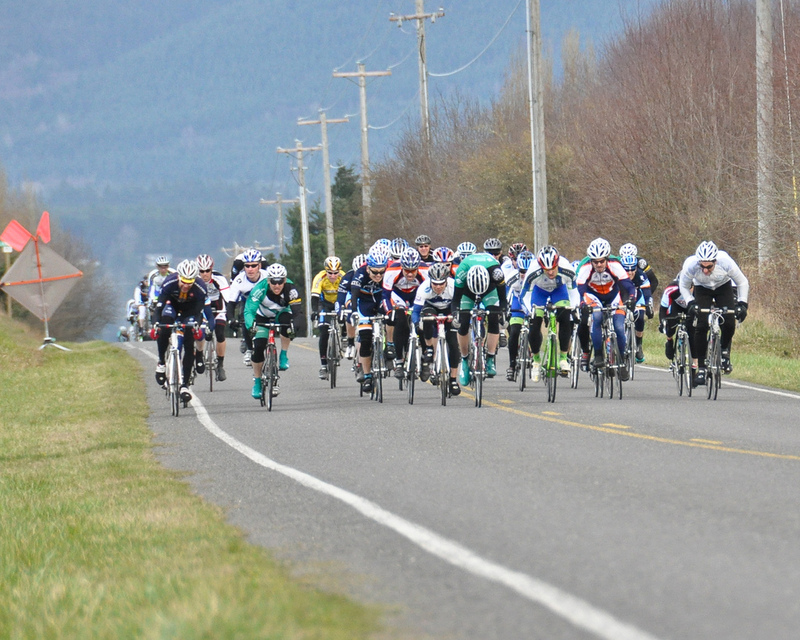 This weekend promised decent weather and a fun day of NICE spring racing out in Sequim, WA at the Tour de Dung. Things ended upgoing better than expected; I went out there just hoping to get in a decent workout, and maybe help get someone from the SCCA / Starbucks Cycling Team up on the podium. Instead, I ended up taking home a win! 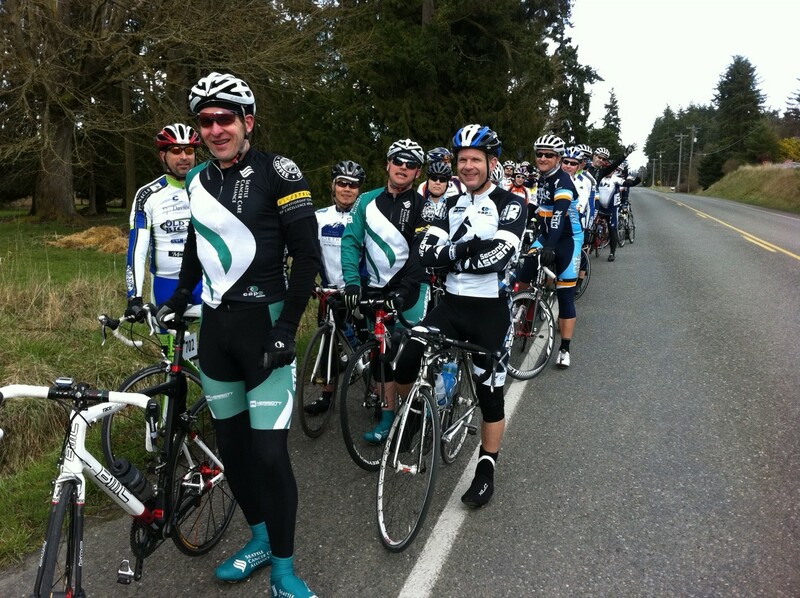 We had a great time today out in Sequim – nice to get out and ride in sunshine again for sure. In Master Men’s 4 we had myself, Ed, David I, Rhett, Charles, and Greg. We met up on the ferry for some strategic discussion – Ed’s been on a tear lately and it’d be cool to get him a win, so we discussed how to pull it off. The math seemed pretty straightforward to me, however we had somewhat divergent ideas on how best to achieve such a goal. Ed wanted to try to force a breakaway. But I thought this’d be pretty hard for us to pull off at a course like Dung, and wasn’t the best way to spend our effort given that our proposed protected rider (Ed) was a fast and strong sprinter and we had several other big, fast guys along with us that day. We had all the makings of a kickass sprint leadout train. If you’re in a race that’s *very* likely to come down to a bunch sprint, and you have multiple strong sprinters on your team, optimize your plan for a sprint, right? Going off in a breakaway is a guaranteed way to burn lots of matches, and *if* that’s the best way to burn your matches to get a win I’m all for it. But for sprinters, you’re better off holding those matches until the end. For example – how many breakaways do you see Mark Cavendish, Tyler Farrar, and Alessandro Petacchi in every year? Still, Ed is in the best form of his life and was fired up to try something, and we all really wanted to help him out. We’d need help though. I went hunting for collaborators. I floated the idea with some of the guys from Cycle U to try for a break at the “climb” at the back of the course on lap 3. They had a few strong guys also, and we reasoned that if we could get a few folks from each team away together, the remaining teams wouldn’t be able to counter, especially with a combined Cycle U / SCCA-Starbucks effort back in the pack to disrupt any chase. Good enough for me, let’s see how it goes! As the rest of the guys warmed up on their trainers, I opted to skip the warmup and instead fueled up with a delicious brat dog graciously cooked up by Sean Phillips, our resident State Roadrace Champion and master brat chef. As I stood there chewing on my pre-race meal, watching my teammates diligently warming up, I wondered to myself if I was making a mistake. Of course! I had forgotten mustard! Problem solved, and soon I had a belly full of power. Ready to race! As we began lap 3 (the lap where we were going to potentially try something) I maneuvered myself close to the front of the pack to get ready. Old Town Bicycles had a strong rider off the front, and I noticed their team slowly amassing riders at the front just as we approached the “climb”, most assuredly in an effort to encourage the pack to take it a bit easier on the way up and let their man slip further away. Should we let him go awhile longer, or was this a chance to do something? Could this be the spark to ignite our break attempt? WWJD? Jens would motor off into the sunset in a blaze of breakaway bravado. So I spent a few watts worth of brat power, bridged up and caught their rider at the base of the climb. I could tell he was fading by the time I got to him though, so I just kept going past him without even a look over. By the top of the hill I was clear, but only by a few seconds. I figured if anyone from SCCA or Cycle U were able to come with me or bridge up to me, maybe bring the Old Town rider with them, that was our best possible opportunity for a breakaway attempt. But by the time I finished the downhill and cleared the righthander onto the back straight, the gap hadn’t changed and I didn’t see any of the right jerseys coming up to join me, so I shut down the brat rockets. Oh well. Now it was time to plan for the endgame – recover, eat, drink, rest up and prepare to sprint. Lap 4 (final lap) and now the pace was picking up a bit. The last solo break attempt had been caught, we were all back together. At this point in the race everyone’s thinking about a pack sprint, and it’s important to fight for and maintain position in the pack. You want to be NEAR but not AT the front. We had a good spread of riders from SCCA/Starbucks near the front, and I was hoping to hogtie Ed long enough to put a leash on him so we could form a proper leadout train. Unfortunately, right within sight of the final righthand turn (about 2 miles from the finish line) the referee car pulled up alongside us, with honking and shouting aplenty. We were enthusiastically ordered to full stop, pull over to the shoulder and hold up. Huh? Turns out there’d been a baaad wreck in the women’s 1/2 race at the 200m mark, 3 riders were down and ambulances were rolling. Yikes. Good thing the referees had working radios and were able to stop us before we all descended on top of the scene. We were stopped for a good 45 minutes. Pretty strange to get that close to the end of the race, start warming up for maximum burn time, then have to shut down completely and cool off. Blue balls for sure. But there was nothing we could do but wait, and freeze. Once the ambulances had helped the fallen riders ahead, the referee cleared us to restart. With less than 2 miles to go I knew this was going to be an extremely painful few minutes. Everyone was cold and shivering, muscles were cold and cramping, but there was no time to warm up and ease back into it gently – I went from my “fully resting” heartrate to “full anaerobic” in less than 10 seconds, just so I could make sure I was where I wanted to be going into the final kilometer. I wanted to enter the final right hand turn no further back than 10th, and no further forward than 3rd. I wanted to have Ed right on my wheel, and ideally have 1 or 2 other teammates ahead of me to lead the train to the final 200 meter mark. I could get Ed to 50 meters, then Ed could take it home. Unfortunately in the chaos of a last minute restart like that, we ended up going into the turn pretty much every man for himself. Ed was in 2nd / 3rd position (a bit too far up for the protected rider) and I was in 5th (just about perfect). David was close behind me, but I wasn’t sure if anyone else had made it up. I yelled once at Ed to drop back and get on my wheel but he couldn’t hear me. Time was running out, and I could feel the pack boiling up behind me. Time to unleash the mighty fury of bratwurst! In sprints I sort of switch my focus from looking directly ahead of me, to “pulling back the zoom lens” so I’m paying more attention to my peripheral vision, looking under my elbows for signs of another wheel coming up and around me while I simultaneously focus on the guy in front of me. It’s a rapidly unfolding chess game at this point, everyone’s bluffing and waiting for the others to twitch and launch his sprint, and then for the followup twitch(es) that signal he’s hit his limit, is dying, and it’s time to come around him. I look for these twitches / tipping points. Every rider has “tells” like in poker, I look for a sudden elbow drop, or a look back, or a slight hesitation like he’s thinking about shifting. When you see the rider at that moment of hesitation, it’s time to stick the knife in him and launch your own attack. Hey look, a white line! Looking at the numbers it was a pretty weak sprint, probably because I wasn’t even close to fully warmed up. On a good day I can hit 38mph to 40mph, and 1300-1400 watts in a flat sprint. This was a downhill sprint, and I only hit 36mph and 987 watts. But since it was equal footing / nobody else was warmed up either, 987 watts were enough to get the job done. Thank you bratwurst! 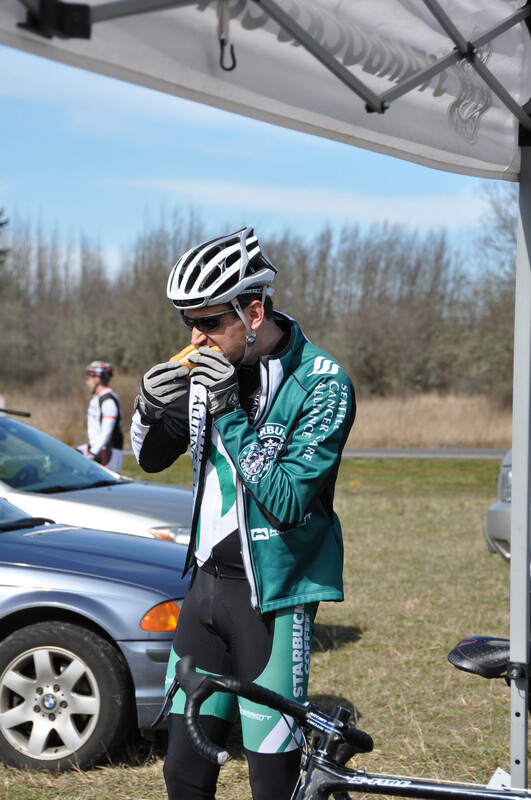 Protip 1 – Prerace meals: bratwurst. Protip 2 – Trainers at flat ‘n easy road races: skip em. This might sound blasphemous, but IMO there’s zero need to warm up on a trainer before the start of a 2+ hour pancake flat roadrace. Unless you have reason to believe the race will immediately shatter with a break right from the gun AND you don’t think you can hang with the pack as it chases, skip the warmup. That’s what the first 5-10 miles are for. If riding a trainer helps you relax and focus your thoughts that’s one thing, but otherwise IMO you’re just burning watts that could be put to better use later in the day. Save your watts, eat some brats. Update 03/21/2011: here’s the whole set of photos from the day, thanks again to Denise! Good Job! Luke thinks you never play Xbox with him. Must be due to all the trainin’.